Of course I was intrigued! I love when makers come up with new, unique ideas (even when they sometimes make you question whether they make sense…even better) and Dan and Brian have done this more times than once over the last few years. The reason this is Part II is because the guys decided to revisit their original design of the Baux Pen (pronounced “box”) to make it more refined and to give it an overall facelift. 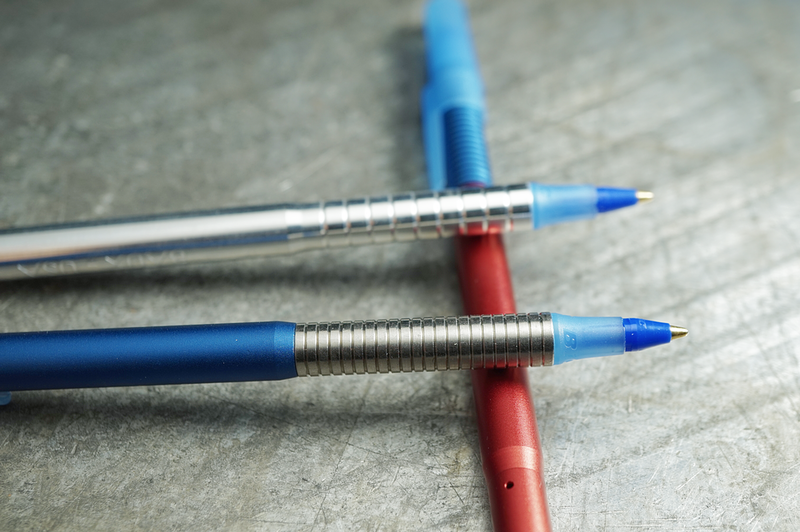 Over the last couple of years I’ve watched as they’ve progressed their machining and design prowess on another product line of theirs, the Spoke mechanical pencil series, and it has been awesome to see their new products hit the scene. They’ve brought Baux Part II again to a Kickstarter campaign which has already funded and is still running now. The original Baux Pen was very simple. Machined from one piece of aluminum with just a few options for color, and their logo was hand stamped with a hammer onto each pen. Still, super fun and super cool. What we have on Part II are pens that have three individual pieces that are machined with more precision and refinement as I mentioned above. This isn’t a knock on the original by any means, but is meant as a compliment to call out how nicely their products are being made today with the shop they work with. Progression and improvement are amazing qualities that I love to see from companies that send me products to review. The three pieces are the grip section, main barrel, and end cap. All of these parts unthread and, with this new Kickstarter, allow for more mixing and matching which is fun. The grip sections come in both aluminum and titanium options, but the barrels and end caps are limited to aluminum. One thing that a lot of people might not know is that many incredible artists create their works using just a simple BiC pen and, by volume, BiC produces the most pens of any company in the world. So, yeah. To refill the pens, you can simply buy big multipacks of the BiC Stics and Crystals you like and then swap in the parts and you’re good to go. One interesting thing about the Baux pen is the fact that it uses the BiC cap to close the pen rather than machining their own. Not only does it cover the tip when not in use, but they machined the pen with tapers on both ends to also allow for posting. I consider using the original cap as a nod to the BiC as well, but also helps to cut down on cost for these too I’d wager. 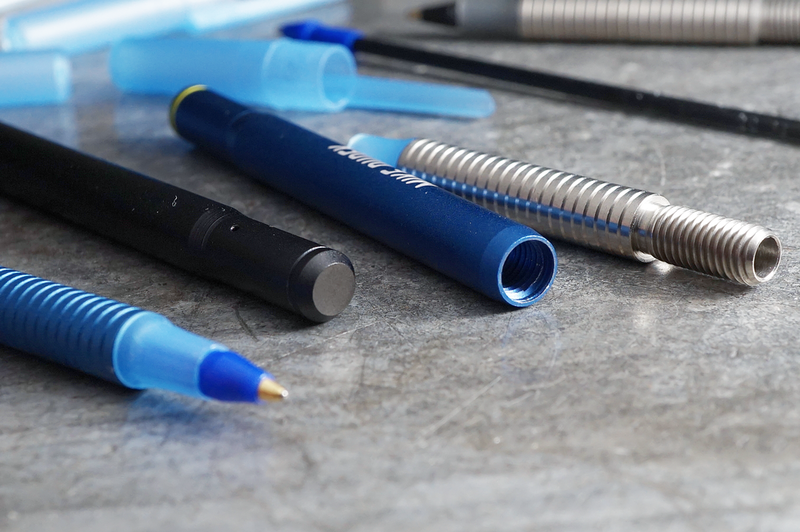 Although, a fully machined pen and cap would be cool… or even a BiC Clic version? The grip section on the pens have 21 machined grooves spaced a couple millimeters apart which are quite comfortable and help a considerable amount with keeping hold of the pen. Another thing they added to this project is the ability to customize the pen with your own name or phrase which is neat. From a cost standpoint these are considerably cheap. 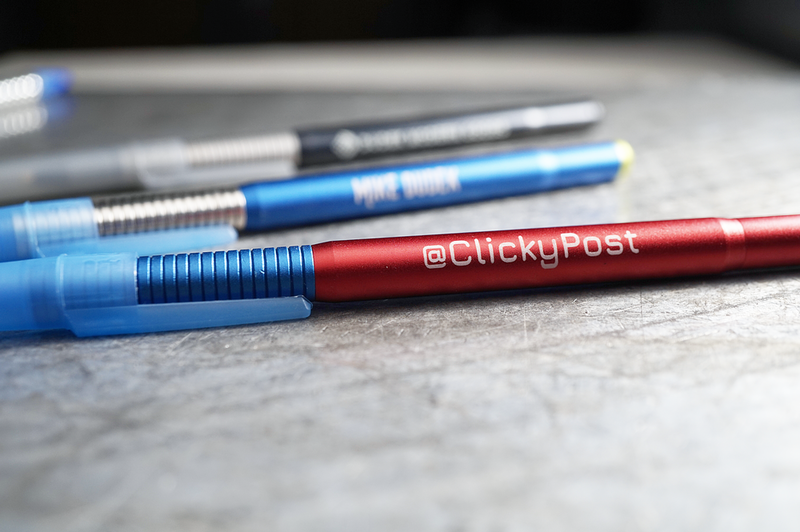 For the standard aluminum versions they start as a 3-pack running just $9 per pen body which is pretty cool. The prices do go up as you get into titanium, but not too bad. And, the finish and quality in these are fantastic at such a reasonable price. Bravo guys. These are projects I love to see happen and I think it is a lot of fun what they’ve produced. Even though they sent me a few samples, I’m definitely going to back the project for a few more. I did this with the original Baux Pen and found I gave a few away to friends that liked them too. Special thanks again to Dan and Brian for sending these my way to check out and definitely go take a look at their Kickstarter campaign which wraps up soon.